Items 71- out of displayed. CrpytoCurrency EW report Issue 3. We would appreciate your feedback on the report. CrpytoCurrency EW report Issue 2. Here is update on crude oil from an article posted on Dec 11th. Now in video format. Enjoy! We know that crude oil is in strong uptrend since summer of this year, up around 40% in just a few months. If you are our member or if you are following some of our free analysis and charts on twitter, Facebook or even watch youtube videos then you know that we have been looking and talked about that move up already at the start of 2017. What I have noticed now, when market is finally in uptrend and showing a clear characteristic of an impulse, is that some are already trying to call a top here. Now ask yourself, is that a wise thing to do, or shall we rather just follow the path? Well, there is a formation of higher highs and higher swing lows so clearly I want to look in the direction of an uptrend. 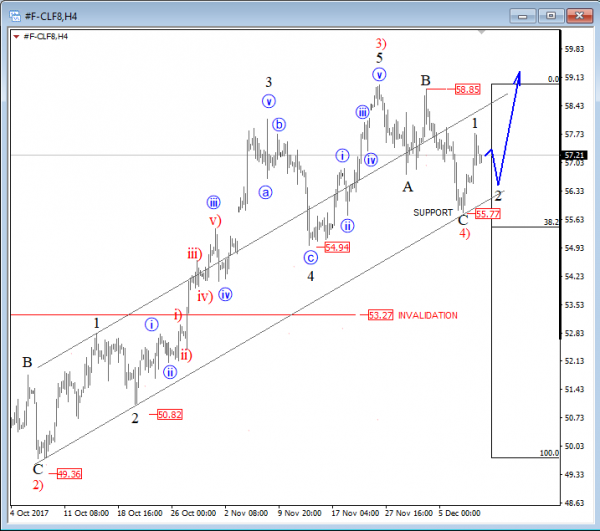 In fact, latest decline from above $59 level was only in three waves seen as wave four, so if you are familiar with EW patterns, then you know that fifth wave is in view and can finally hit and even pass important $60 per barrel. This leg up can already be in progress if we consider recent turn up from 55.70/80 that came from that trendline support, connected from October, so in our eyes oil remains in uptrend. Recently we have seen some negative correlation between US and EU markets. We can see S&P50 moving sharply higher while DAX came under pressure this month and fall aggressively since start of November. 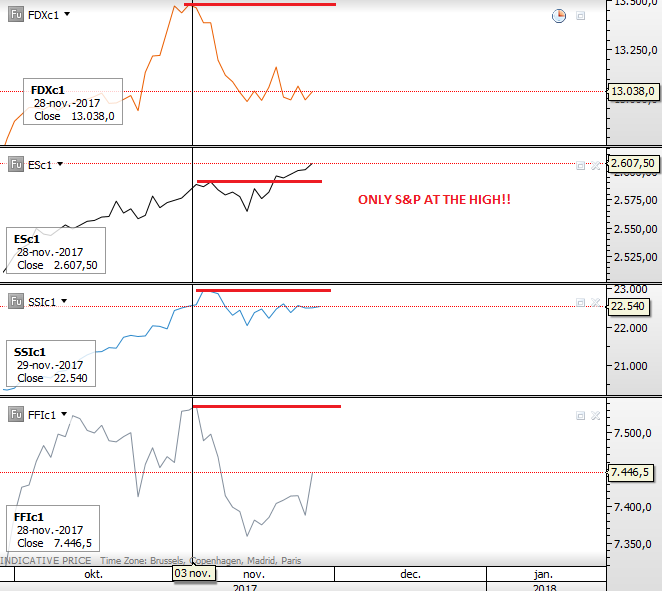 On the chart below we can see that Nikkei, DAX and FTSE100 are all trading lower, while S&P500 is the only one trading at the high. This is not what you want to see in “risk-on” environment since it can mean an upcoming a reversal. Technically speaking, I think that other three indexes suggests that sooner or later US markets will also turn lower for a pullback. The reason comes from a clear and textbook pattern on German DAX, which shows an Elliott Wave cycle in action. It’s a five wave pattern up since late August that peaked on November 07, after that aggressive fall down to 12900. It was a strong impulse reaction, labeled as wave A. Well, when it comes to trading you want to trade in the direction of impulses, which means that now it should be to the downside, same but opposite to what we have seen in that uptrend since September when each slow price move (blue circles) represented a correction. So if we respect what market is doing, then price may do the same thing this time, but to the downside as current slow price move around 13000 also looks like a correction, ideally wave B. 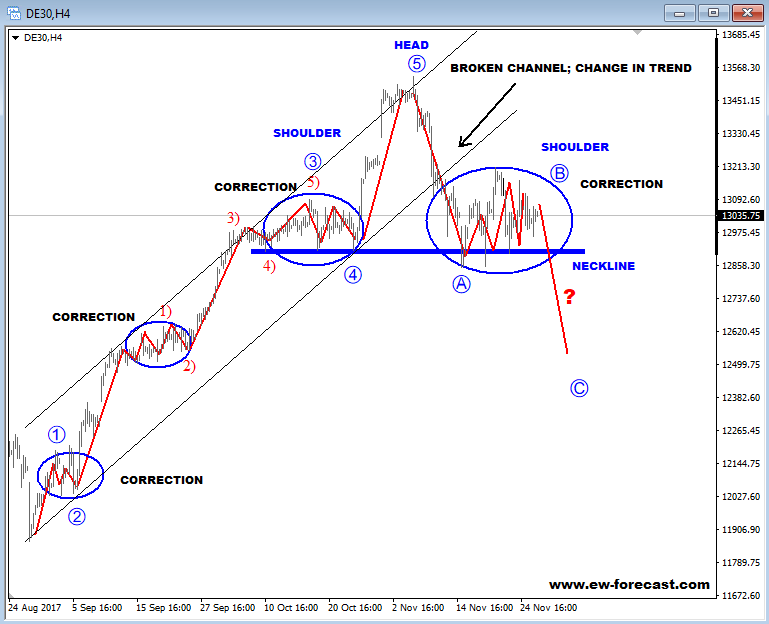 Despite that, we also know that from an Elliott Wave perspective any reversal in trends should be made by minimum three waves, so on our chart wave C is still missing which should take price below end of wave A. Also, there is a bearish H&S pattern, which is pointing lower too. So my conclusion is that DAX will drop, same thing is with Nikkei and FTSE100 which are in similar situation, and this could cause a temporary limited upside on S&P500 as well. My view remains unchanged as long as November highs on DAX are not breached. If you want to be on track with intraday price move of Dax and other correlated markets, such as EURUSD, then you may consider to take a trial of our services. We have seen a nice turn up on EURUSD in the last two weeks so it appears that pair is not bearish yet and that we may see another retest of 1.2 level while Crude oil keeps moving higher. At the same time we see commodity pairs turning up for a corrective recovery while GBPUSd is sitting on a big trend line; will it fail? I will also look at Bitcoin EW cylces. In our new video we will give you an update on Crude oil and NZDUSD from last week. I will also cover AUDUSD.